Radim is prototyping new motion sensor for our clock - with this module it will be possible to turn on the clocks automatically only when there is someone around. This will prolong tube life and decrease power consumption (which is only 5-7W anyway). But first we need to get real field experience in testing! 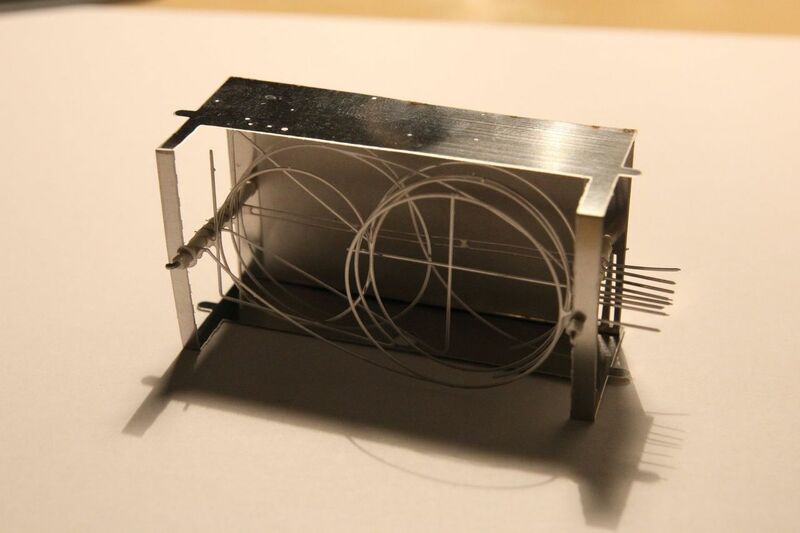 We are intensively working on new burn-in/testing device for our nixie tubes. The main person in this project is Sebastian and he is pretty good at it. The progress is (as usual) much slower than I expected, but the result already exceeds my expectations. 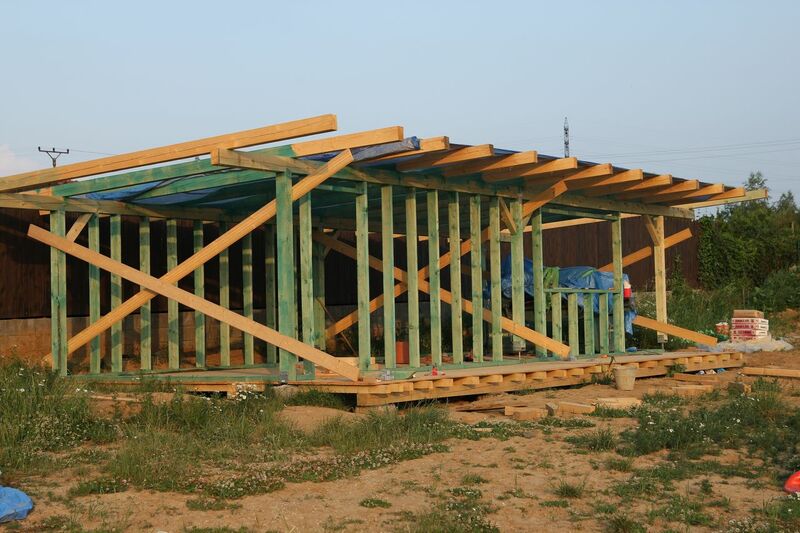 Two months and it should be ready. I decided to revive our Youtube channel. I believe I managed to distribute the work among my coleagues effectively, so I hope to find time to documenting our successes and failures for our followers. We attended the top Czech design event of the year - Designblok. My expectations were totally different from the reality. 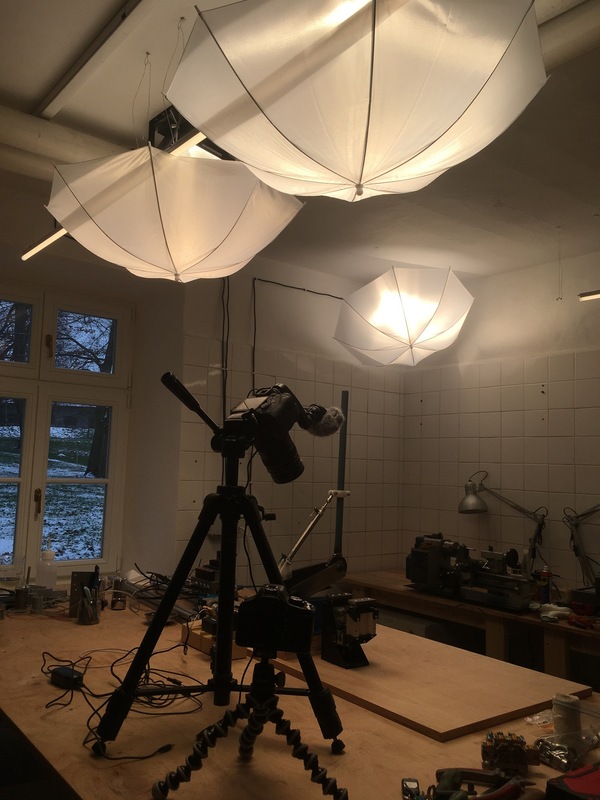 We spent much more cash than I expected and got much less orders than I expected :-) But we also established some cooperations there, so at the end of the day it might be worth the effort. We've got a fresh reinforcement.. Sebastian, a fresh EE graduate joined our team. He already spent a month on an internship here last year, so the arrival is seamless and maximally efficient. Now the development of electronics will run at elevated pace! We finished development of new clock - Puri Nixie Clock. A four tube clock with even more simplistic design. I picked the best from Zen clock and added some new features as polished bases, electronics hidden in the stand and some new safety features. I met Radim, local student of electrical engineering. 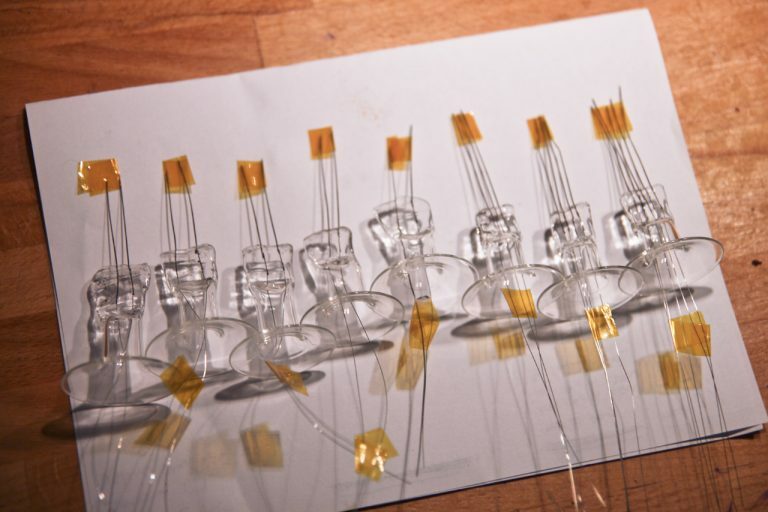 Together we make new cleaning system for parts for our nixie tubes. With Gravelli, we made a nixie clock with concrete stand. 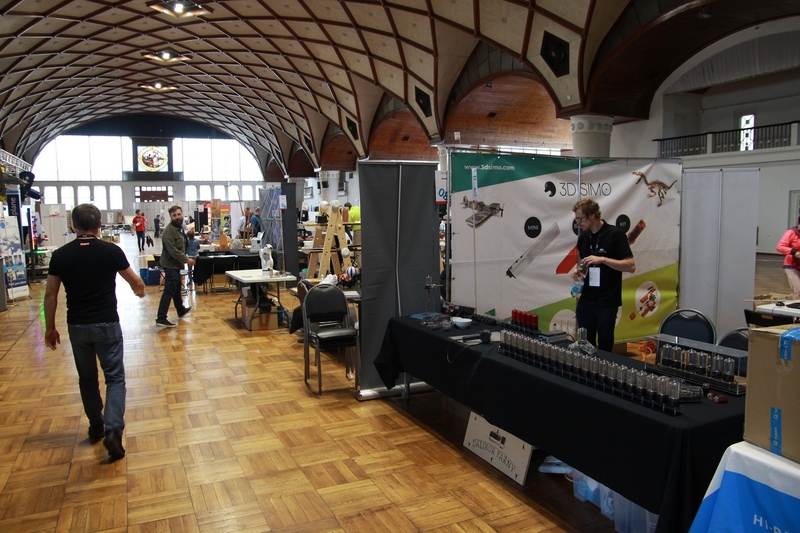 June is practically only about preparations for Maker Faire in Prague - first Maker Faire in Czech Republic. I make several experimental projects - argon filled tube, red coating for our tubes, display with 22 tubes. 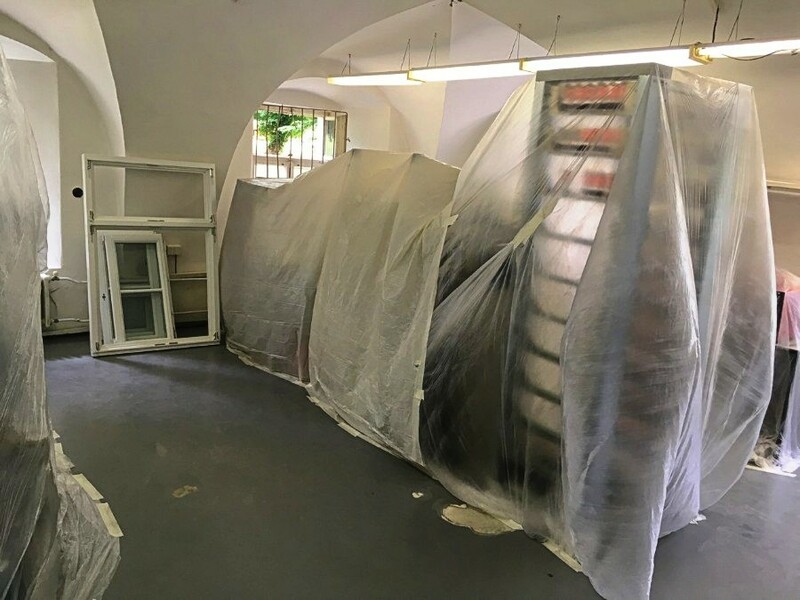 The castle is getting new windows - we need to prepare all rooms, cover all equipment with plastic foils and then tidy all from dust. We develop first version of packaging for Puri clock. I finally finished development of the colon tubes (separator tubes), it took me two years from idea to working sample ready for production. There were many unexpected issues over the time and I often felt it was a mistake to start with it as the resources spent on its development were so high. After plugging the colon tube into the clock first time, I immediately knew it was good decision to make them - this little detail make the clock! 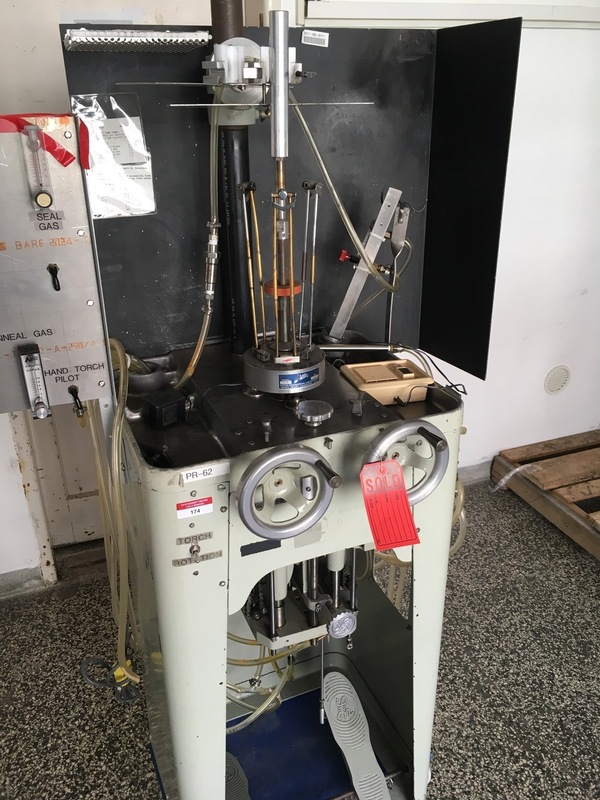 Important addition to our machinery - I acquired two machines for sealing vacuum tubes, my first commercially made machines designed for vacuum tube production! 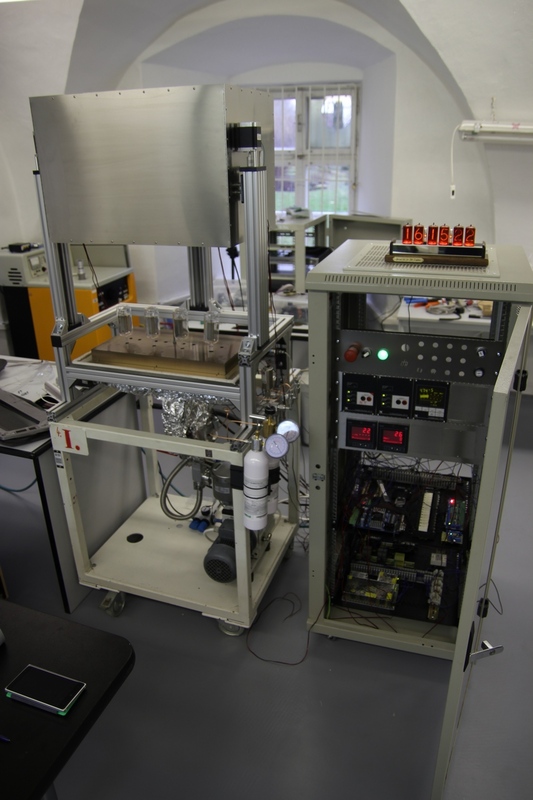 This will help us manufacture different tubes in future. At nixie tube #4000 another set of improvements was applied to our glass to metal seals, lowering the leak failure rate close to 0%. I am making a simple machine for cutting getters from strip, this is first project with usage of several pneumatic cylinders. And I finally get my new Prusa i3 MK3 printer! Most of the clock orders from 2017 were shipped, on 15th I am opening orders again - and receiving tens of orders instantly. We need to work on optimizing of manufacture. Monika unfortunately decided to leave, she would train Lenka (new employee) for tube assembly in following two months. I also need a help in office - I am hiring my sister Renata, she would communicate with suppliers, customers and will take care about packing and shipping our products. We started working on a mobile application for control of our clocks. The app should be easier to use than web interface, I am curious to see the results. January was also a record month in sales - $70.000. And exhausting, no further R&D was done - I can devote my time either to making of nixie clocks or doing development..
Money issues solved, payments are flowing again to our account. I am finishing mechanical design of the colon tubes. We are working on a new clock case made of concrete with Gravelli. 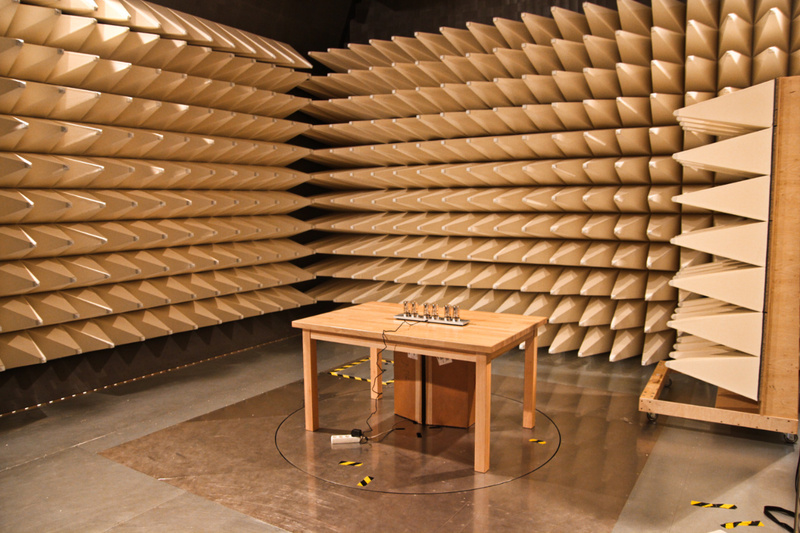 I take the clock for EMC testing, passing! Guys left home and all suddenly broke down. A problem with our payment gateway appeared and we would not receive payments from customers for six weeks. 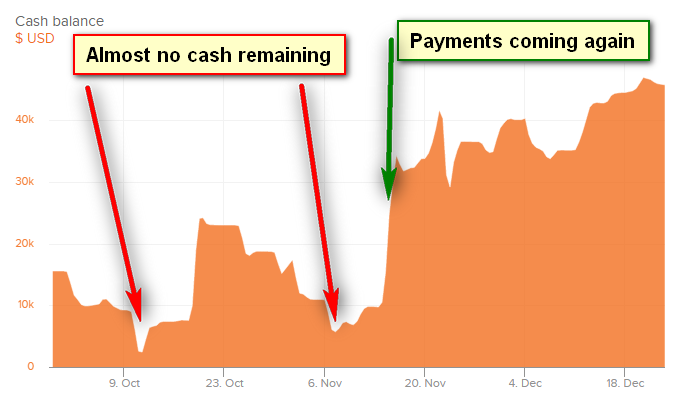 Our cash balance drop below $2,000. I just signed a contract for new website which will be our biggest investment so far. Key employee struggles with serious health issues, another key employee might leave because of health issues of a close relative. Production runs perfectly, in addition we have beautiful autumn here. Daniil, a light bulb designer came to spend a month with us. Sebastian (student of electrical engineering) came for a month-long internship and seamlessly joined our development processes. 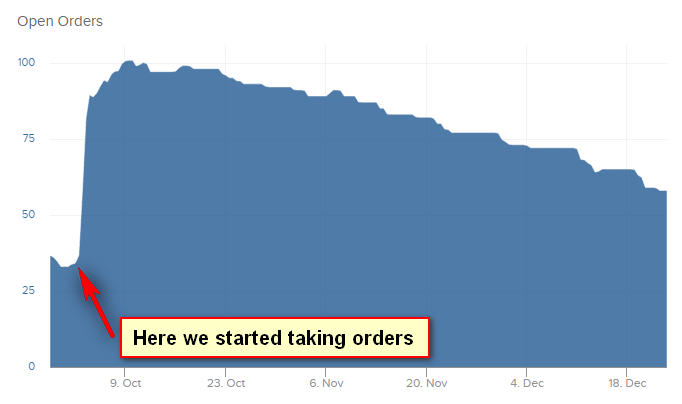 We reached $30k monthly sales, our best month so far. Life can't be better. Past months were pretty much frustrating and I swear the failures must never appear again. 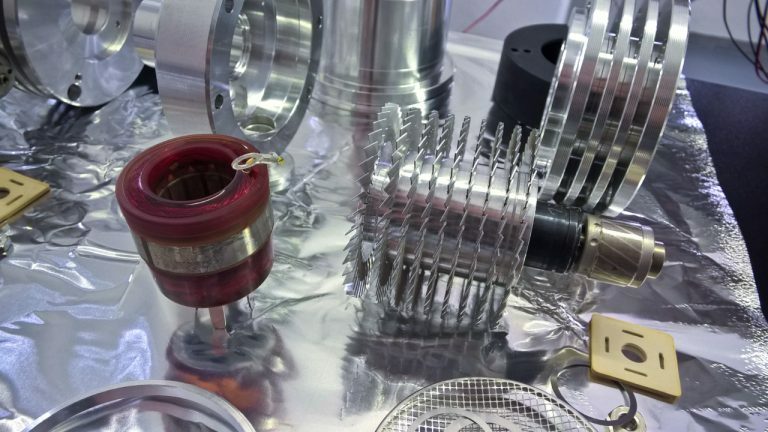 In following months I would reorganize half of the manufacture, standardize quality control and cleaning of all incoming parts and developing better leak checking procedures. Since tube #2500, the failure rate drops from 4% below 1%. With the team waiting for me to figure this out, I was sourcing tungsten wire from all around the Earth and analyzing its cleanliness and surface quality. Eventually I found super high quality manufacturer in USA. Ten times higher price, quality wins.. It would pay off in following months. Summer was mainly about improving reliability of our glass-to-metal seals. With current manufacturing techniques, we experienced 2.3% tubes to fail within 6 months from manufacture. Whole process of manufacture of glass to metal seals was revisioned, starting with material selection, quality control, leak checking etc.. The last batch of 400 tubes shows 0% failure rate so far. I was reported of several multiple failures of our tubes, leakage. It was clear we have a problem in sealing again.. I stopped production and spent a whole week in lab. 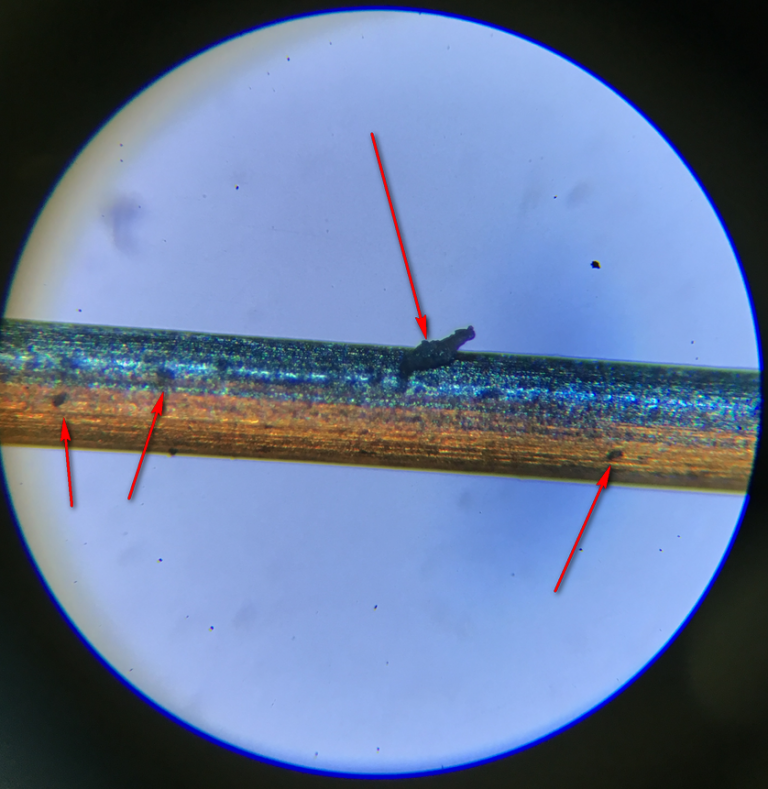 Contamination of the sealing wire was identified as a cause. I am starting works on next model of clock - Puri Nixie Clock. 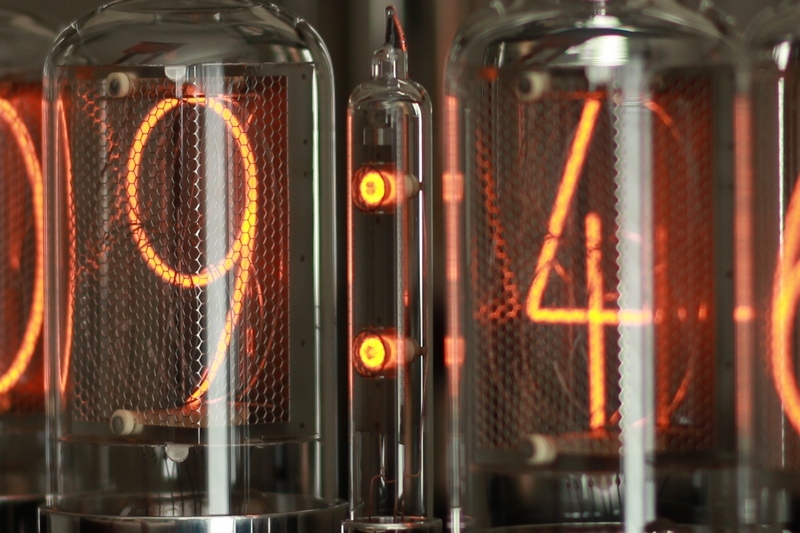 The Zen Nixie Clock manufacture is running at steady, but slow pace. We shipped over 100 clocks and received wonderful feedback from customers! A very high end clock by Frank Buchwald was released by M.A.D. 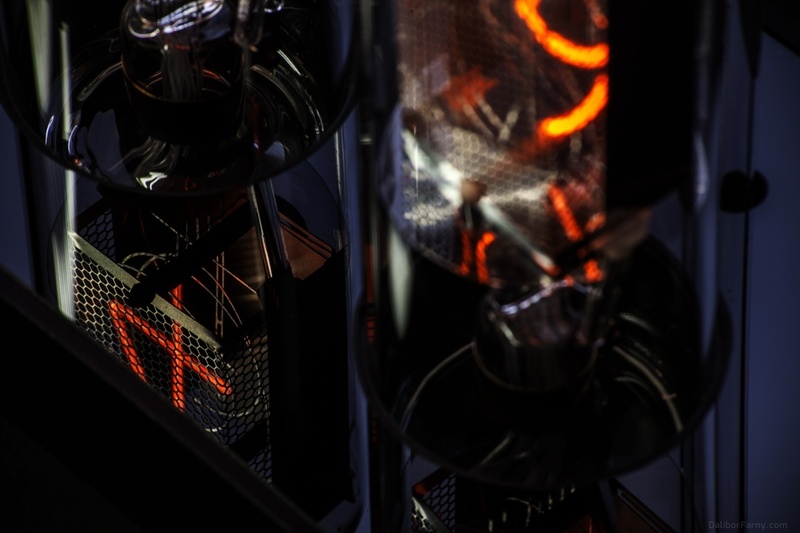 Gallery, its name is Nixie Machine II and it features our R|Z568M nixie tubes. The electronics was also developed in our lab, it has all the neat features you know from Zen clock. In February, I joined a Value Manifesto project founded by Timo Niemeyer. This project is so different from our other projects, cant wait to see it alive! We end the year with $125,000 in sales, $25,000 profit. I devoted almost all my time to development of nixie tubes, no other activites were done in 2016 - goal for that year accomplished. 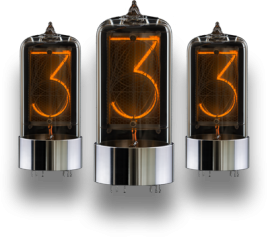 New orders for Zen Nixie Clocks and our nixie tubes are still coming at steady pace. Its clear we will need more room and help. 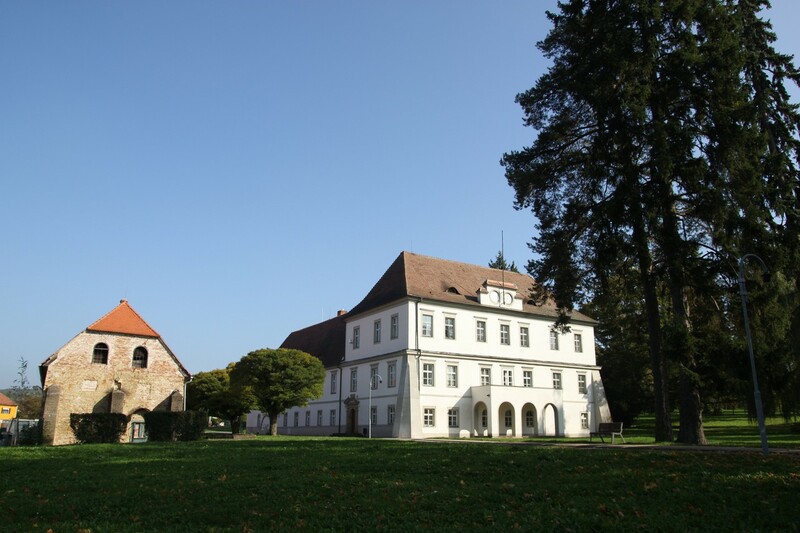 I am renting three new rooms at the castle, doubling the total area to 250 square meters (2700 square feet). 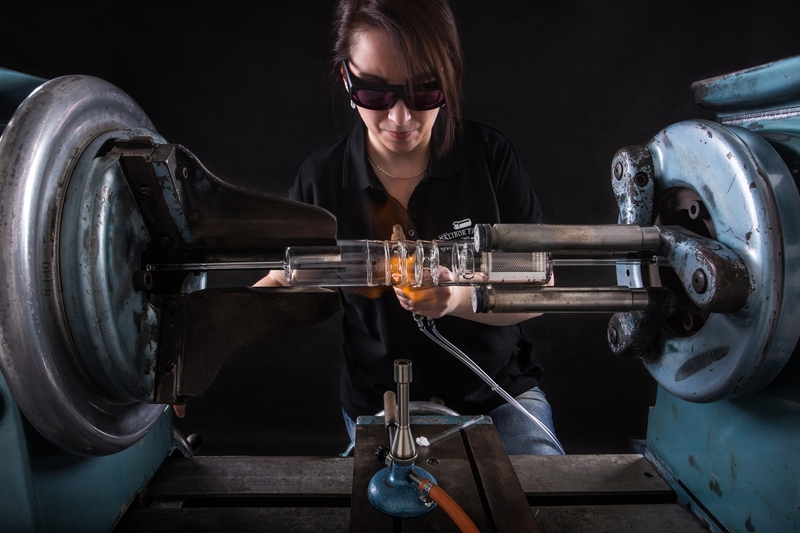 The financial situation is getting better, so I risk and hire a skillful women (Katerina) to train her to glassblower’s tasks. We purchased a set for etching metal sheets to be able to do prototypes and development samples very fast. To speed up production, we got a fully automatic laboratory washer for washing tube parts prior to assembly instead of doing it manually. We still don’t have anodized stands for our clocks, our supplier tried four batches with horrible results. I keep searching for good supplier. 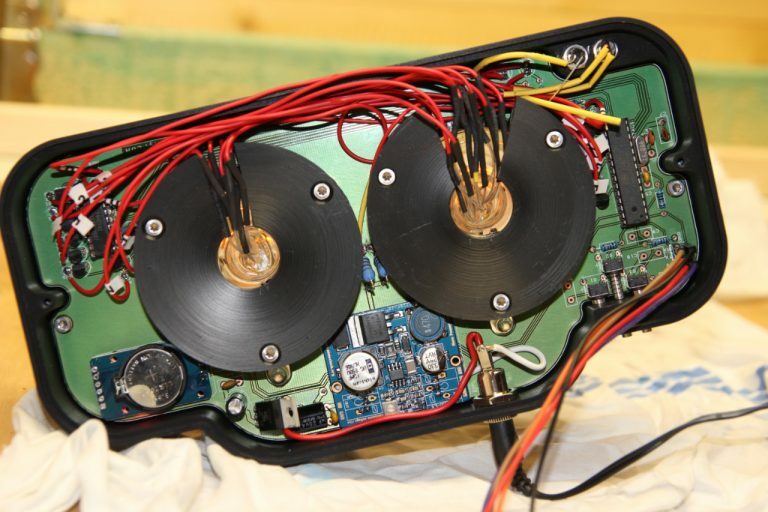 I deliver nixie tubes for first two Bombe clocks by Paul Parry (Bad Dog Designs). The video documentary covering the manufacture of nixie tube at our lab is finished and published on Youtube. 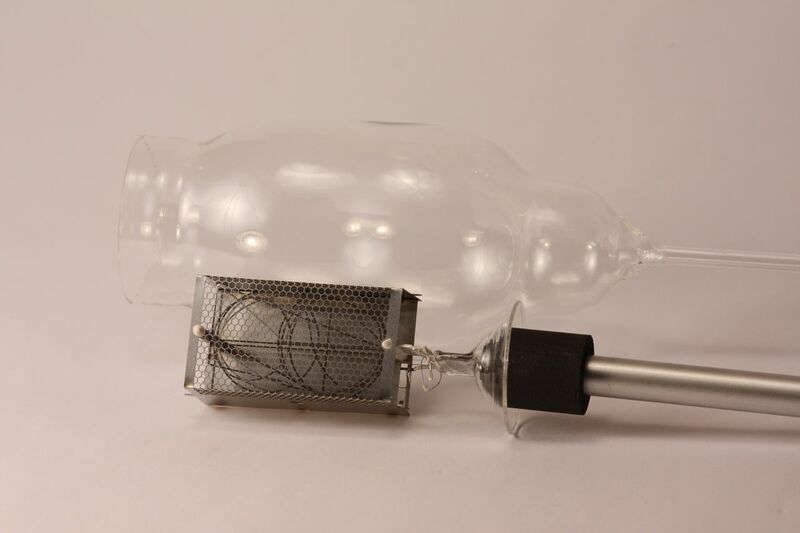 In few weeks, with 500k+ views, it becomes the most popular vacuum tube related video published on Youtube. We get attention of customers beyond the group of nixie tube geeks which brings us new orders. The stands for first Zen clock batch are not yet ready, getting bad news from manufacturer. I am changing supplier of raw material and also machining supplier. I am gettingt 10 orders for Zen clocks immediately, I am accepting more orders with uncertain delivery time. 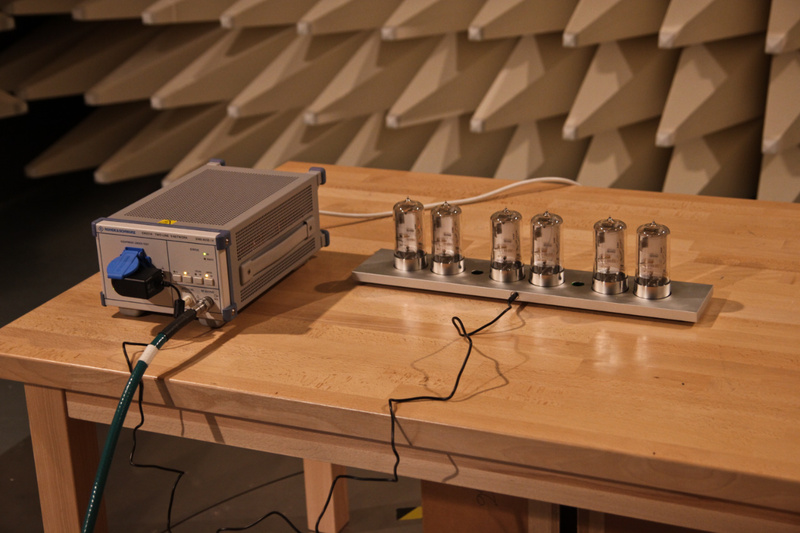 The production of tubes is running without issues, all other parts as well – except the aluminum stand. 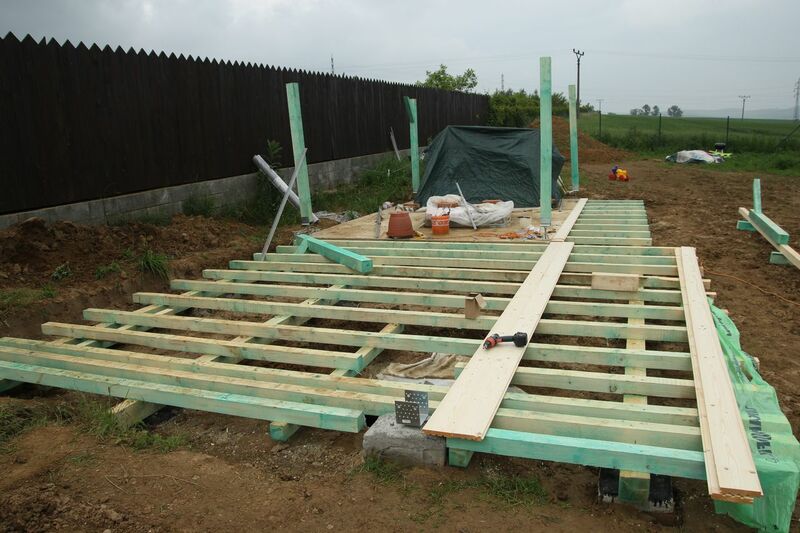 Our supplier is not able to achieve the same good results as in first prototyping batch. We need to order machining of new batch of stands, the shipping is delayed. Small prototype run of Zen Nixie Clock is finished. We have manufacturing processes set up and suppliers for all parts we don’t produce ourselves. I opened pre-order possibility for the clock, limiting it to 10 pieces only to make sure the clocks will be manufactured ontime (in September) without delays. 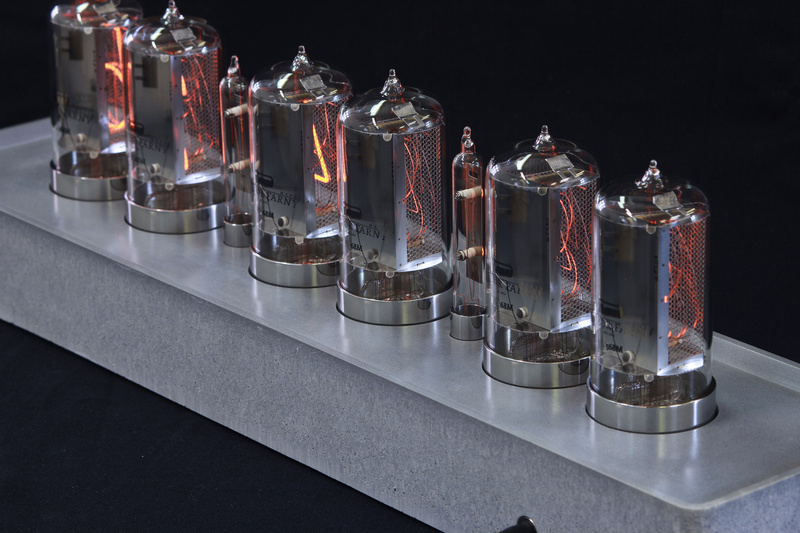 I deliver over hundred tubes to Duncan Hellmers for Blub Keo single tube nixie clock. 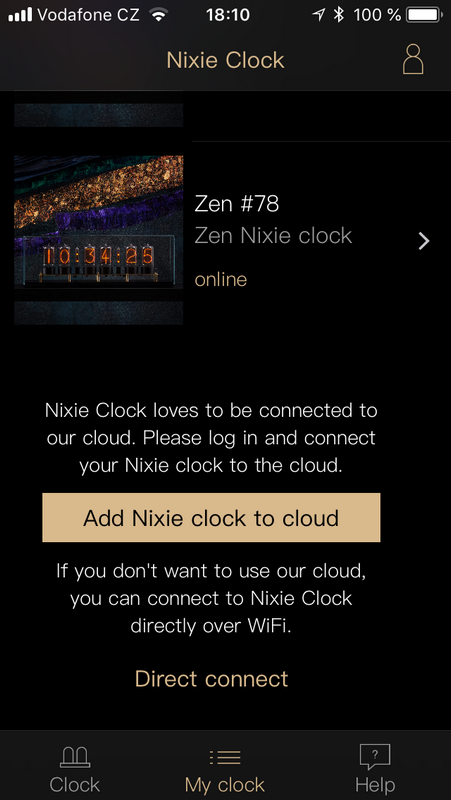 We have first Zen Nixie Clock boards among customers, collecting feedback, improving the firmware. One of the demands is for a case which would protect the tubes and provide a decent-looking way how to showcase the Zen clock. So I am designing a minimalistic case with aluminum stand and glass cover. 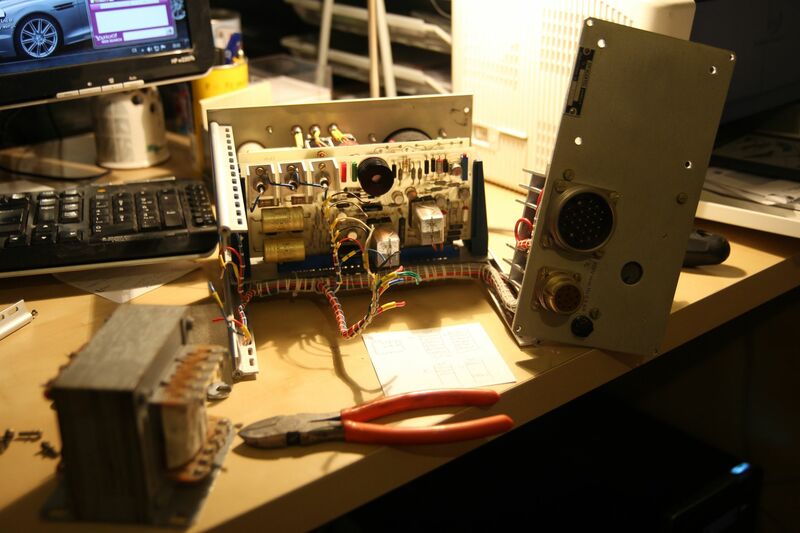 We’ve just made R|Z568M with serial number #800, unbelievable! The most time consuming task for this month was to figure out software bugs in first revisions of the ZEN nixie clock. I am working on making the production of R|Z568M nixie tube more and more efficient, focus is also on little details. It turns out that hiring Monika was great decision, she learns fast and does great job. I also finished some interesting projects – a set of nixie tubes for a Clive Maxfield and his wonderful steampunk style clock. Another finished project is a Sturnus clock which was made together with Daniil Kondratyev under Glowguardian studio. Our first six tube clock is out! First revision of the long-promised six tube clock board is out! I name it ZEN nixie clock, a calm and peaceful way of displaying time. 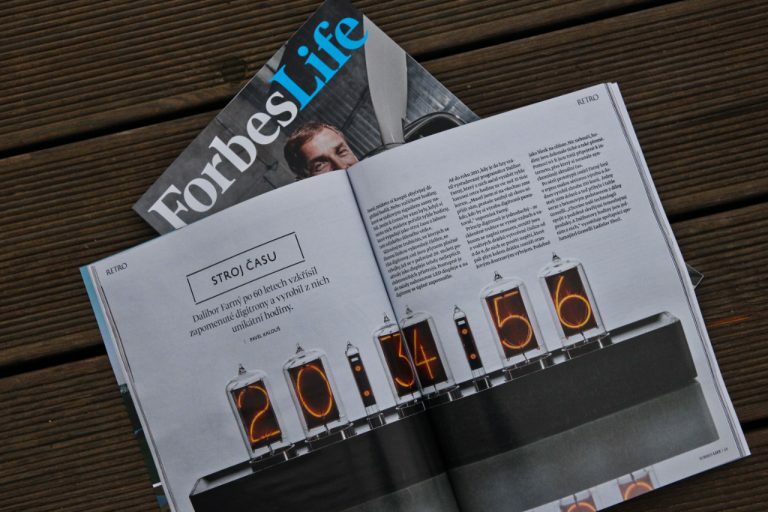 One feature for all – it is connected to internet and all the settings (time zone, display effects) can be adjusted in real-time from user account on our website. Also the time is synced automatically from internet. After months of hesitation, I hired first employee (Monika), finally! Now I am able to delegate some tasks and devote more my time to development.. I also finished new pumping and filling station for my nixie tubes, this will speed up the manufacture and also provide a bit more consistent results. 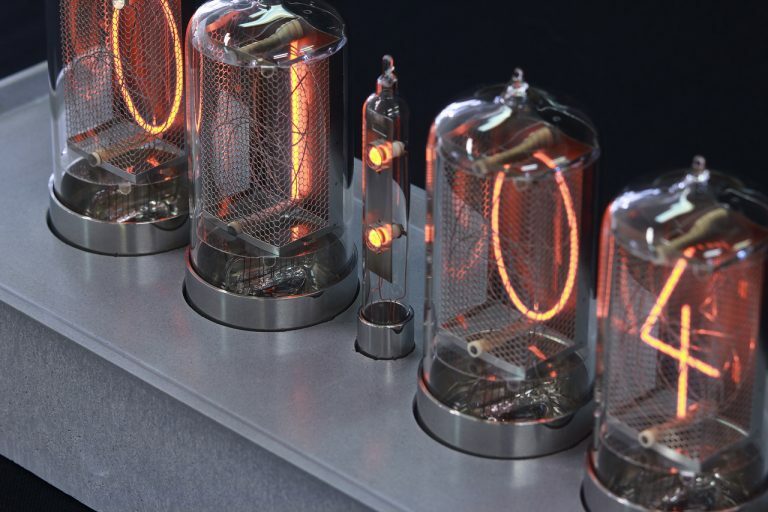 We almost run out of money, at last moment a japanese customer appears, ordering nixie 18 tubes. I can pay rent for next quarter. Subsequently I get few more orders. The goal for 2015 accomplished (to not lose money). 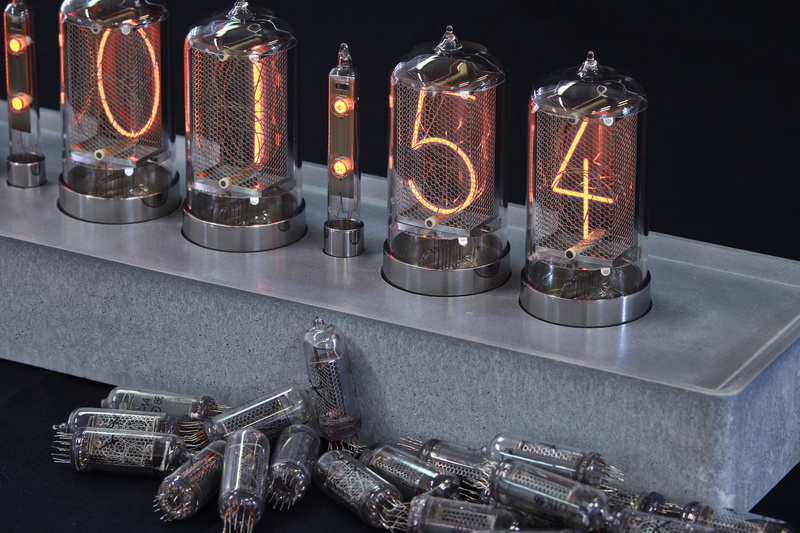 Sales of nixie tubes $15,643. Sales of selling refurbished vacuum equipment is around $37,000. We ended the year with small profit ($625). 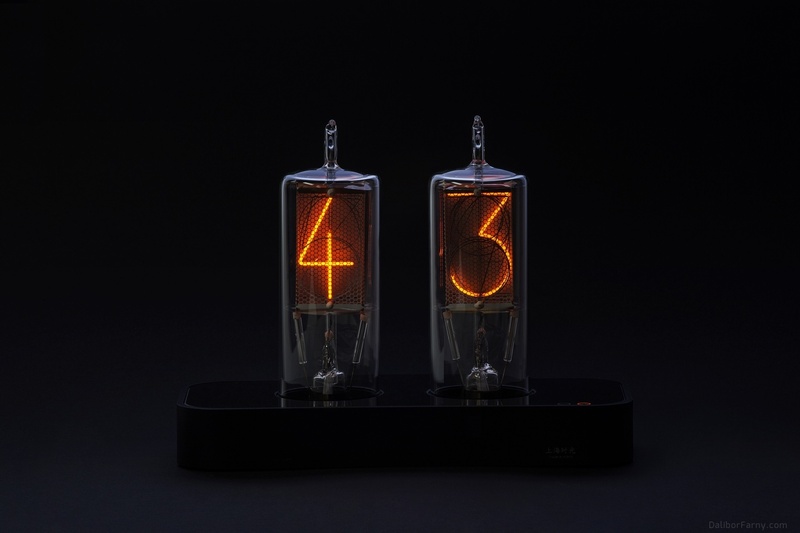 Goal for 2016 - get rid of other activities, focus on nixie tubes only. 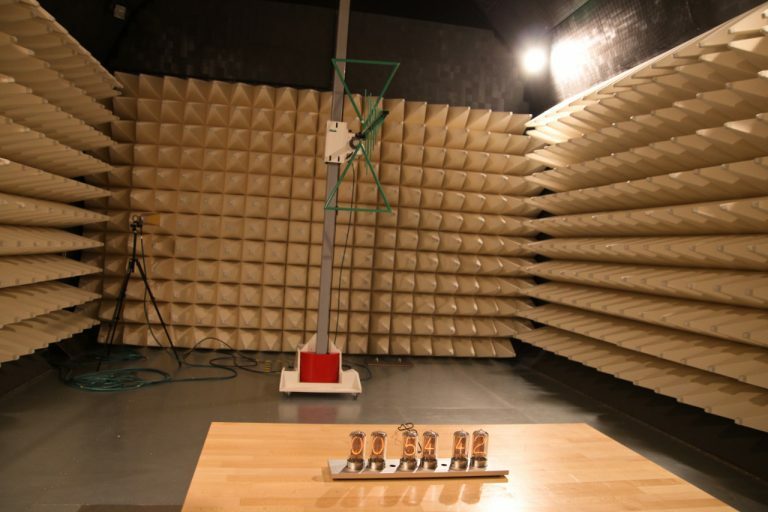 I rented new room in the castle, made it a kind of clean room and moved entire process of tube manufacture into it. The process is now cleaner and well organized. I am spending a lot of time on building new pumping station which will achieve the same high vacuum levels as the old one, but will be much faster and easier to operate. Our twins go to kindergarten, Eva (my wife) joins me and took on administrative work - invoices, accounting etc.. This is big help as I can spend my time on R&D and not get demotivated by piles of papers.. I am making 100+ tubes as a replacements for the bad ones, ouch! 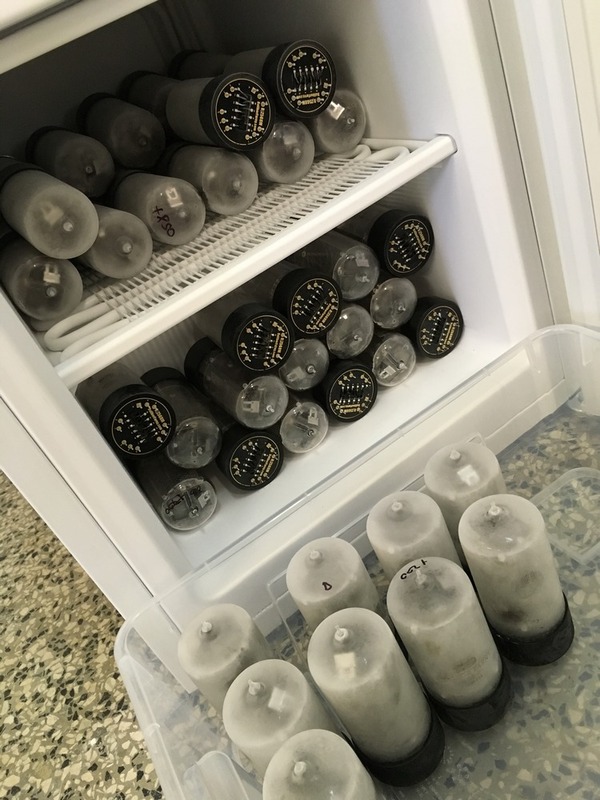 Most frustrating part of the nixie project so far – my first customers reports failures of the early tubes (under S/N #200). This sends me back to lab and I spend months by testing individual materials, gas pressures, gas mixtures, gettering processes, cleaning process and many more. The cause is soon identified – improper curing procedure of ceramic adhesive inside the tube, uncured compound slowly outgas spoiling the gas inside the tube. The overal processing of the tube is re-engineered and since then on I go the way of ultimate over-enginnering of everything. Just to make sure I will not experience situation like this again. I had been watching amazing work of Berlin based designer Frank Buchwald for quite some time – his industrial-monster-insect style is just unmistakable. When I see his Nixie Machine he made for M.A.D. gallery, I simply have to meet him! 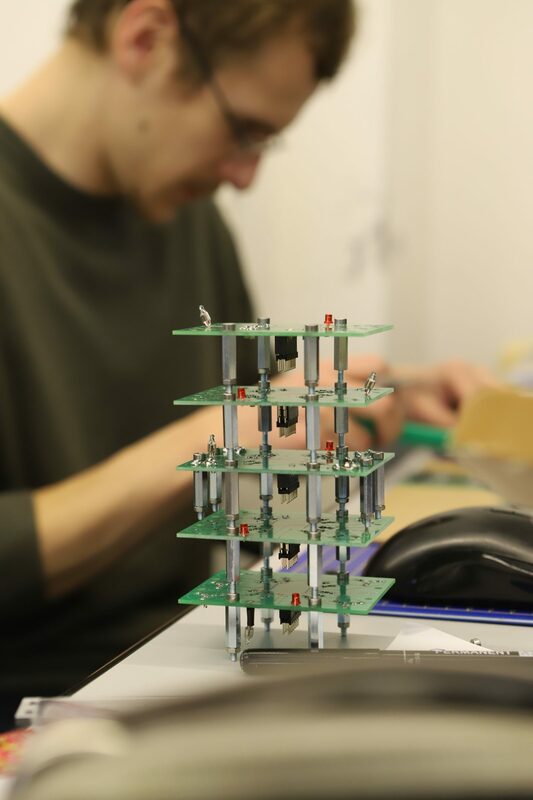 Beginning of 2015: It has been 3 years of very intensive work on nixie tubes now, 10+ hours every day, weekends included.. A goal for this year is clear – to not lose money, cover all expenses from our sales. Emails from people all around the world start coming, I am really happy that I have customers. 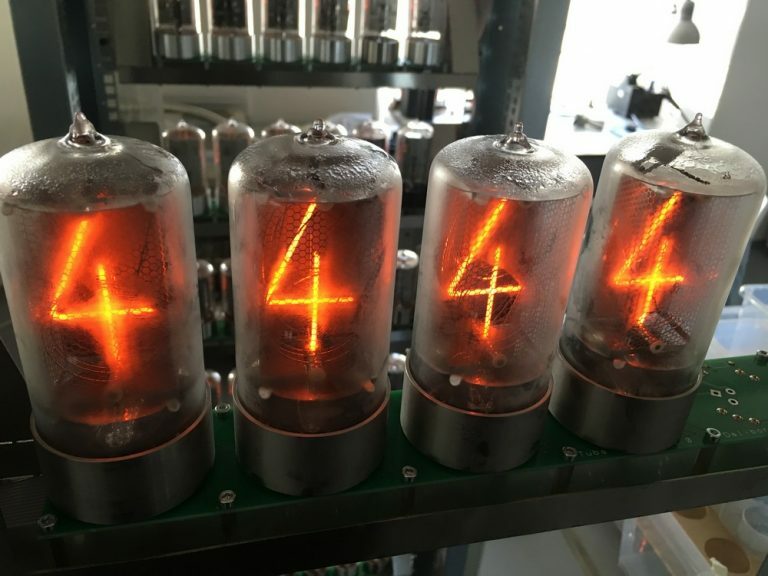 I focus on simplifying of the manufacturing techniques to cut down the amount of time spent on a nixie tube so that I am able to offer reasonable price for customers. The price settles on USD $175 per tube which covers the manufacturing time, shop rental and also keep some profit for another investments into equipment. I am still running on household savings which are shrinking fast.. 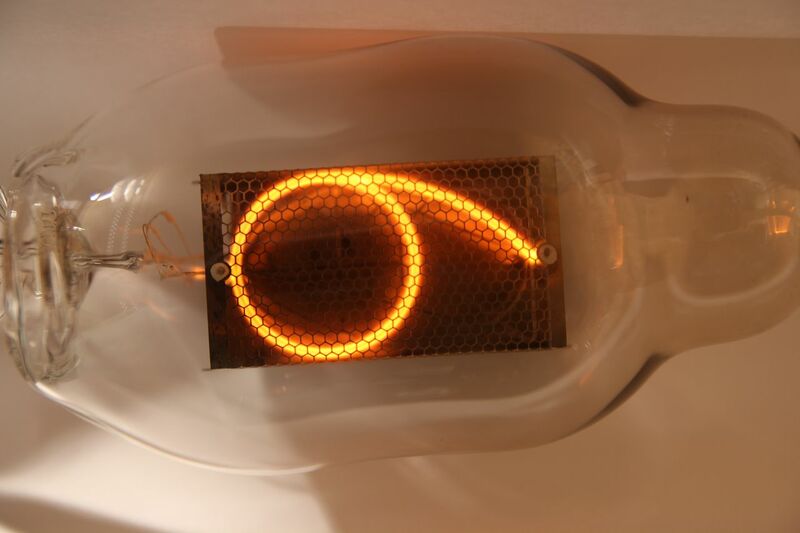 The one-tube nixie clock is developed, I name it Solitube clock - a solitary tube. I sell 20 pieces of the clocks mostly to friends who have been following my stubborn efforts for quite some time. I am receiving first feedback from customers, great! I also hired a part time coworker Karel, he helps me with vacuum stuff refurbishment and do some small tasks on the tubes. Karel is smiling all day long and would cheer up all the team in following years. I think I am now ready to prepare first small batch of nixie tubes. 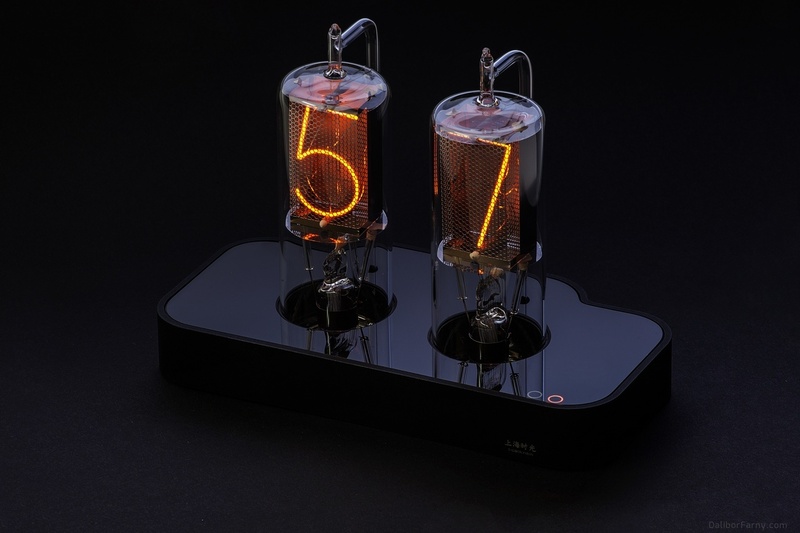 I decide to design a one-tube nixie clock and find first customers who would help me to test the whole product – from the electronics to the nixie tube itself. 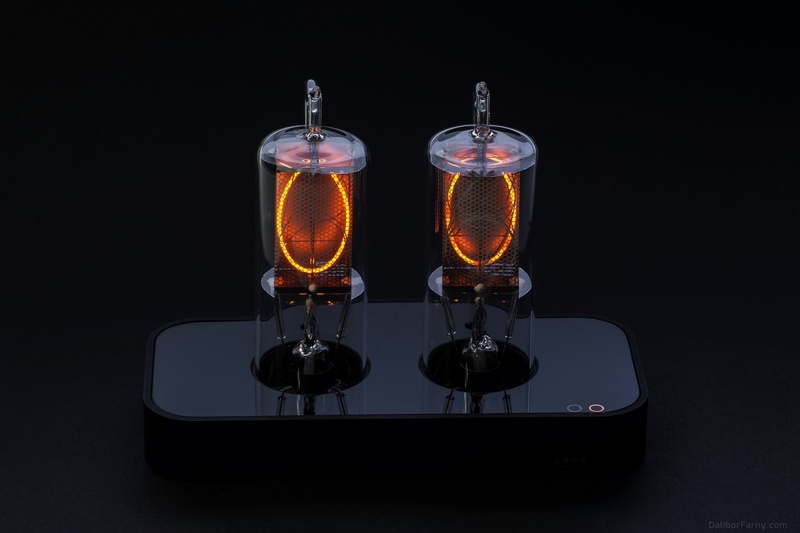 The tubes that I make in this time differ slightly in shape, definitely not ready for a 6-tube nixie clock – the differences would be visible immediately. 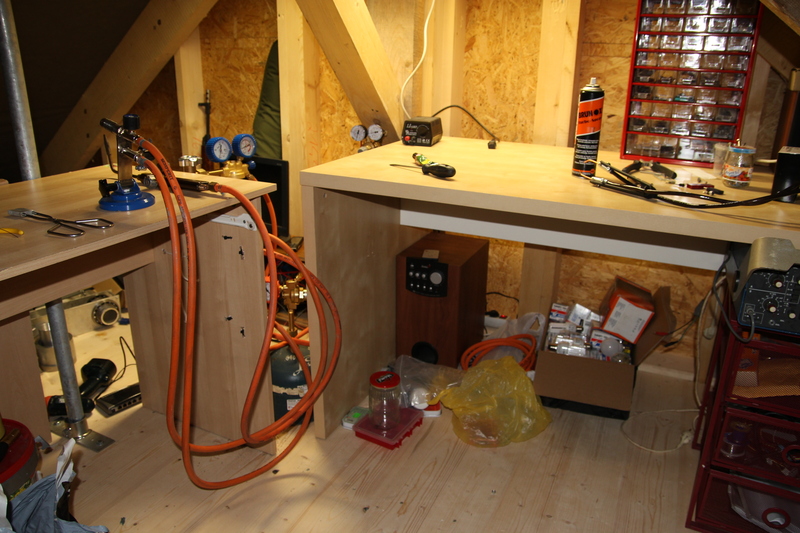 I take on another room in the castle, another 65 square meters added to workshop. I hire accountant, the complexity of importing and exporting all over the world is now so high I need to hand over it to a pro. I move all my nixie tube activities under separate company. This period is mostly about refurbishing and selling of all the vacuum equipment. I am able to buy many pieces for myself for reasonable price, so every cent earned goes back again to tube-making equipment. I am getting familiar with turbo pumps, roughing pumps, controllers, vacuum gauges, vacuum valves and all the other stuff. I am also building a device for activation of getters inside the nixie tubes, called flasher. This is the last tool I need to complete the whole production procedure of a nixie tube. The garden shed starts to be too small for my stuff and I am soon going to move all the equipment for refurbishment from the company to my workshop. I have to find new room to rent. The closest place for rent is a castle from 17th century in neighbour village. The rent there is the same or lower than other places around and is also closest to my current workshop. 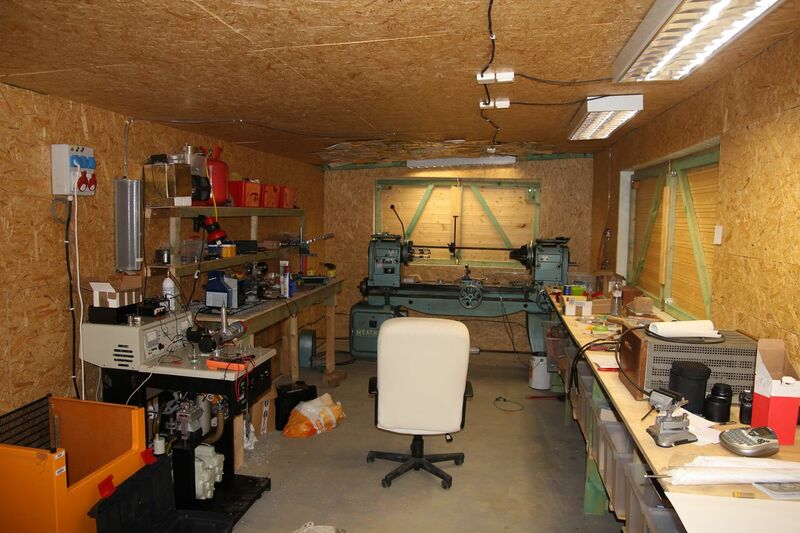 I am moving the turbos and other equipment to my first room in the castle, my workshop area grows by 50 square meters to 85 total together with the garden shed. Castle, new home for my lab. Another crucial moment came to pass. 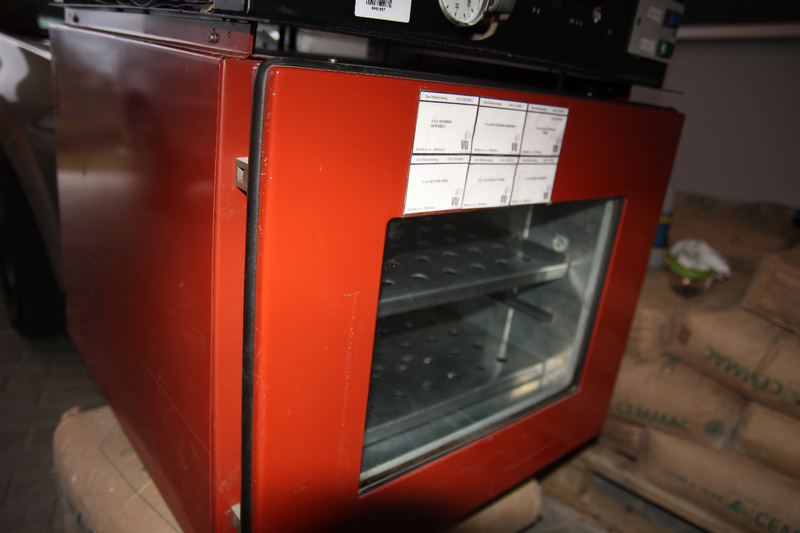 I’ve just found an advertisement of vacuum oven for sale offered by local company.. I am calling there whether I can come and check it out. Jumping to car and heading to the company which deals with stuff bought in auctions from bancrupted companies. What I see there takes my breath away – pallets full of modern vacuum equipment, tens of turbomolecular pumps, controllers, high vacuum gauges, valves, system components etc.. Having no experience with such kind of equipment, I immediately come up with idea to refurbish, test and sell the equpiment. It was first time I actually met a turbomolecular pump, however I was brave (or mad) enough to offer the deal and we eventually agreed. 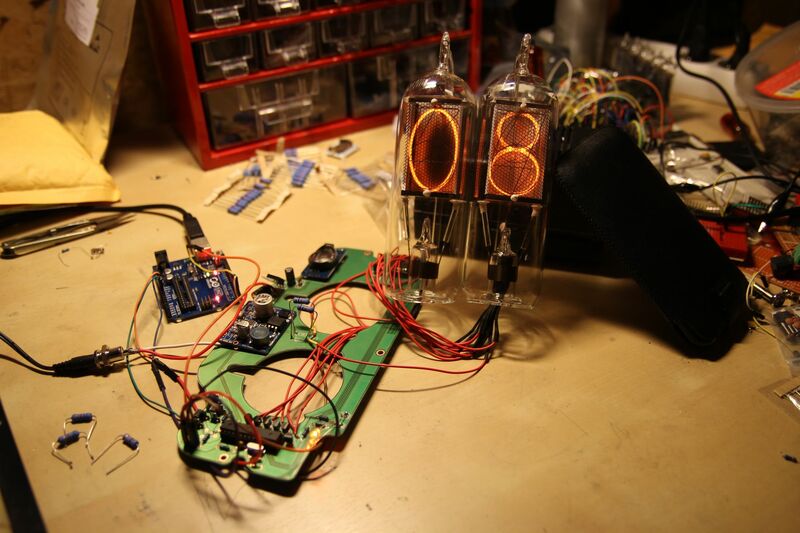 I am working on improvements of current nixie tube. In the meantime, the ShanghaiTime clock is being exhibited in Shanghai Museum Of Glass together with other 19 glass art objects from Czech Republic. Visitors can vote for the most interesting project and the ShanghaiTime gets nice second prize! I work only on nixie tubes and the nixie clock I designed for the contest, 10-12 hours per day in average, weekends included. I dont remember anything but the shop from this month! After really intensive development, I made it! ShanghaiTime nixie clock. 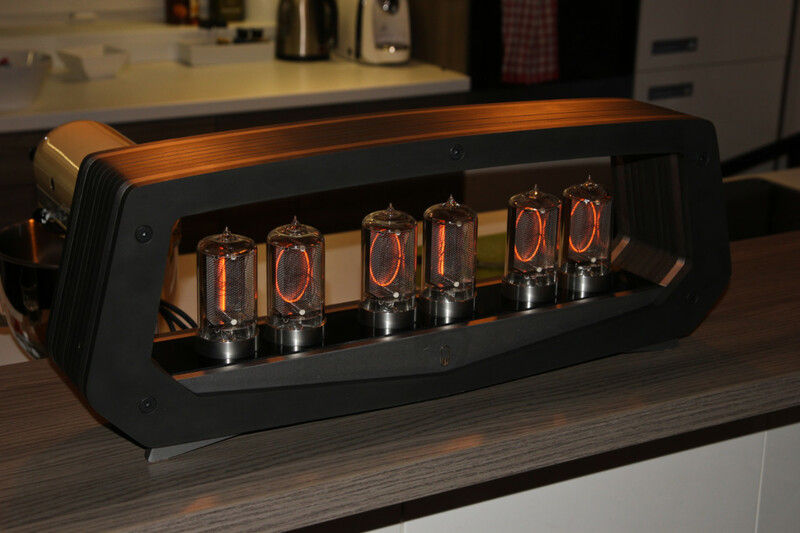 The first nixie clock with newly handmade nixie tubes! 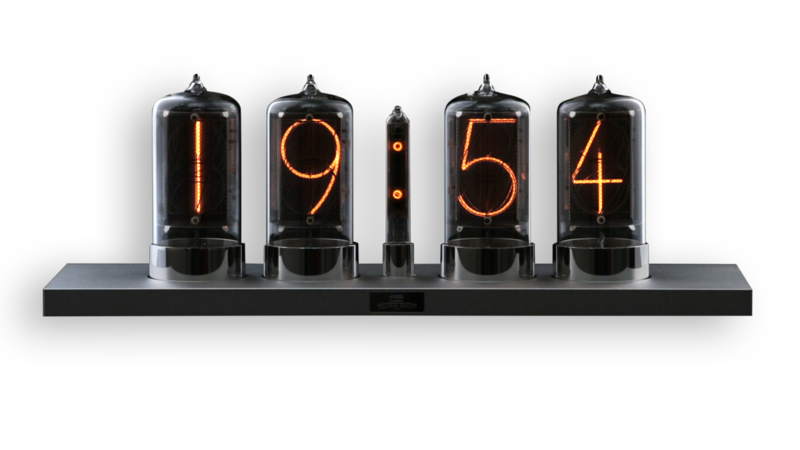 Prototype nixie tubes for the Shanghai time clock! I got samples of the metal parts for the inner assembly, the quality was absolutely exceptional! 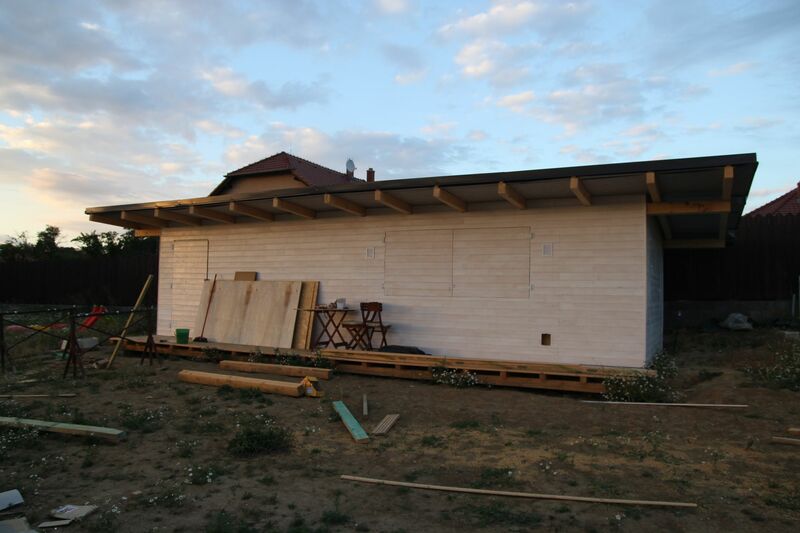 And after almost half year of building of the garden shed, I finally finished it! I started moving the stuff from the attic, 35 square meters of a room just for my equipment! 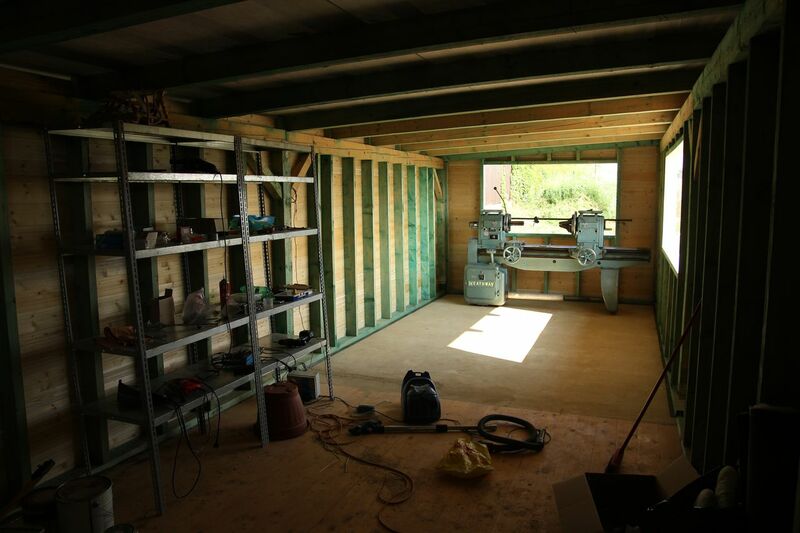 Garden shed almost finished, workshop No. III. 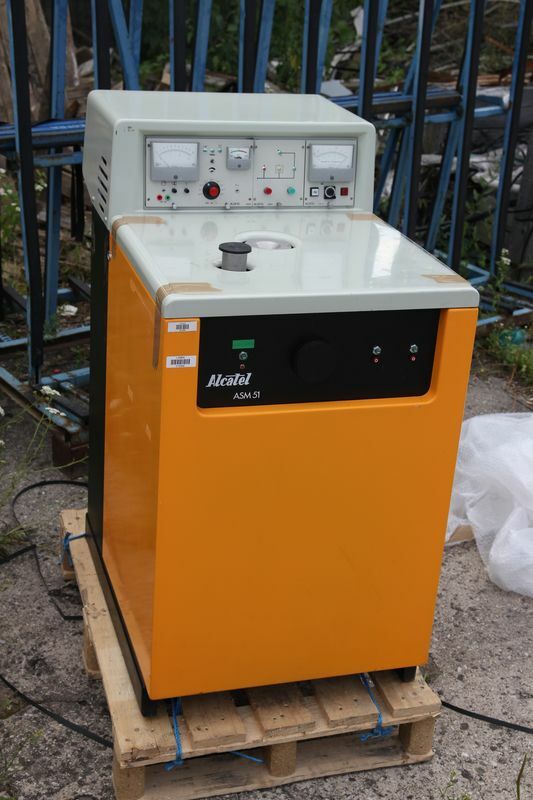 One morning, I found eBay listing for a big industrial Heathway glass lathe on eBay. Great price (only £1.300), similar piece was offered on US eBay for $12.000 recently. I checked the pictures, the machine seemed to be in good shape. 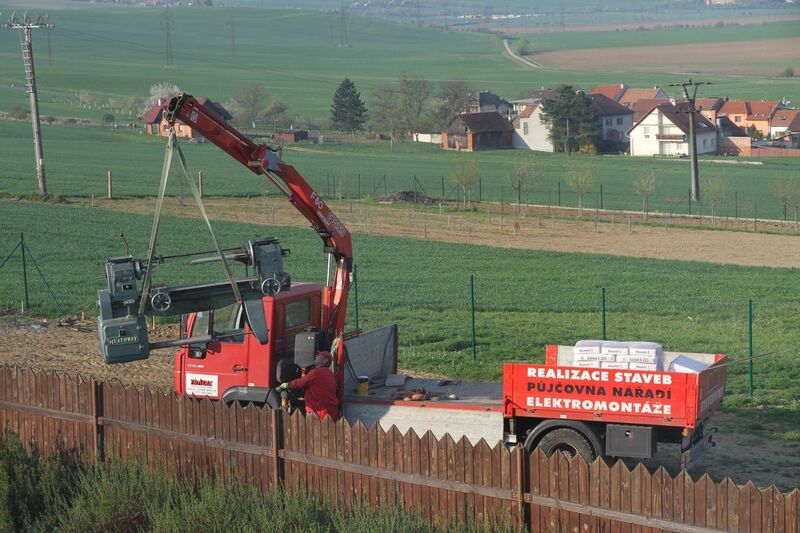 The only problem was that it was sitting in England, 2000km from my shop – 800kg heavy machine!.. I decided to take a risk and bought it immediately. It turned out that the lathe comes from a cancelled university glass shop and the man who sells it is glassblower who worked there. So I paid it and started organizing a transport. It was pretty difficult, but finally, after tons of emails and calls, I found a small company that made it! 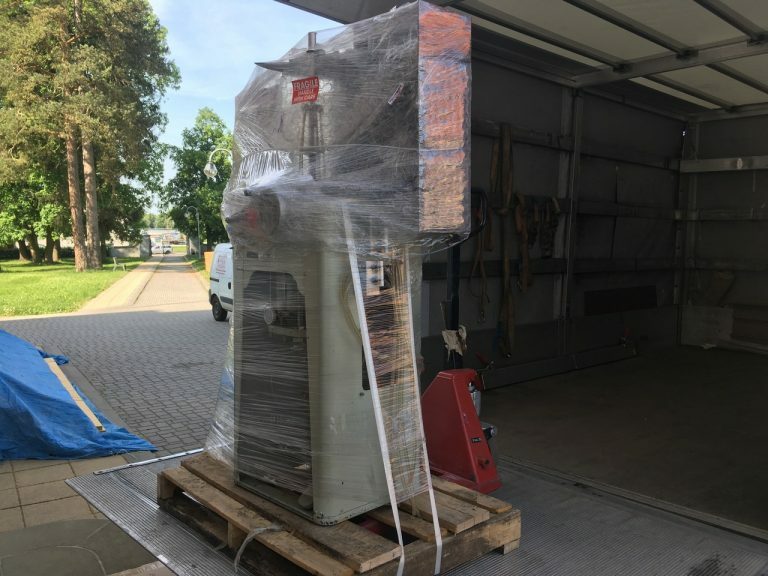 They brought the lathe and put down on a concrete block in my garden that I made two years ago just for the case I will need a big machine.. There was no garden shed by the time they put it down. Glass lathe on the spot! 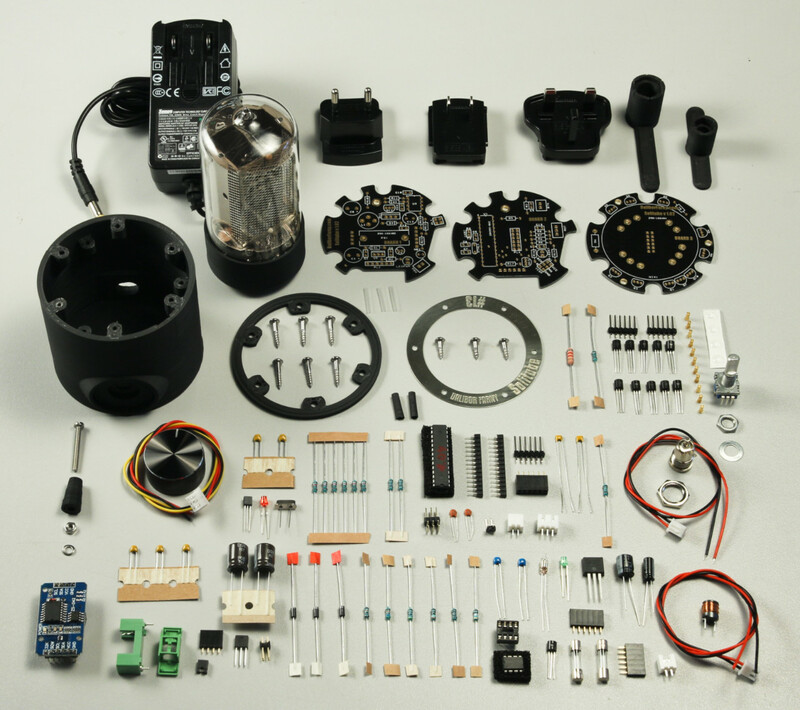 I started looking for a manufacturer of metal parts for the nixie tube inner assembly. I got samples from local company (local companies are first to ask to as I want to support local businesses), but it was not good enough. I found that most of the european companies don’t even reply to my emails, thats frustrating.. I also started rebuilding my torch system to oxygen concentrators as an oxygen supply instead of liquid bottled oxygen. 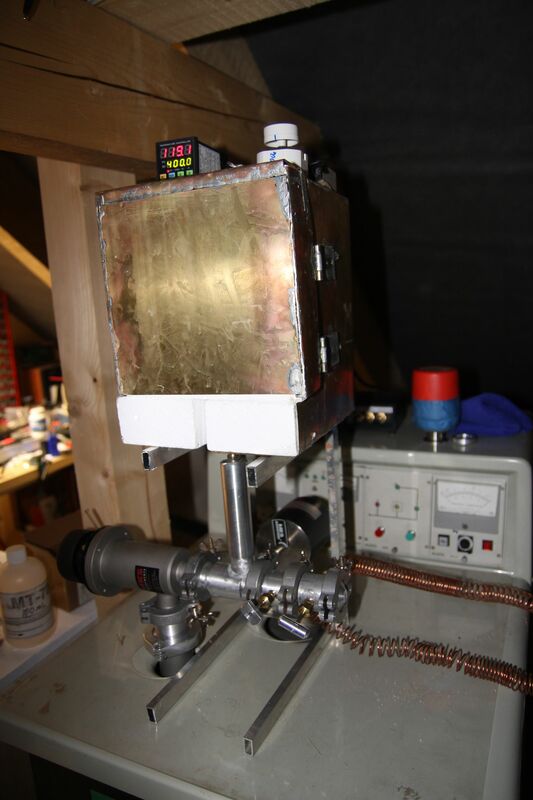 I finished the bakeout oven, it will help me to achieve higher vacuum in the tube. The helium detector broke down, old transformer stopped working - I am searching for someone who would manufacture that part from scratch..
First oven for nixie tube bakeout, worked surprisingly well! I am working on new gas filling manifold, it should be able to supply neon and argon to nixie tubes. I also made a test tube for experimenting with gas discharge. 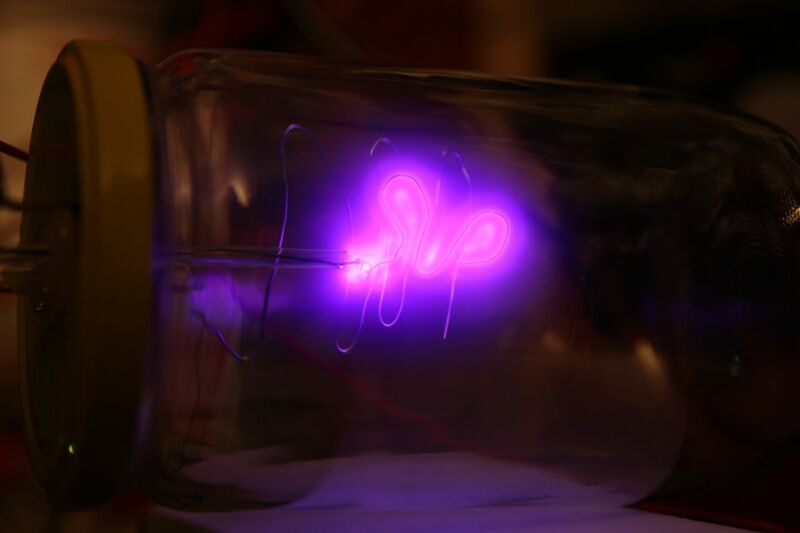 And when I finally made a neon bottle connector, I was able to use a homemade vacuum needle valve to fill a test tube with neon and enjoy the real bright neon glow, much better than argon! Shortly, I made first sealed tube with neon – I mark it “lab sample No.1”. My first neon glow nixie tube, with two digits! Our new house is built and we are moving, I am leaving the shop in basement and building new one in attic of our new house. I now have more room, but I need to be careful with flames. 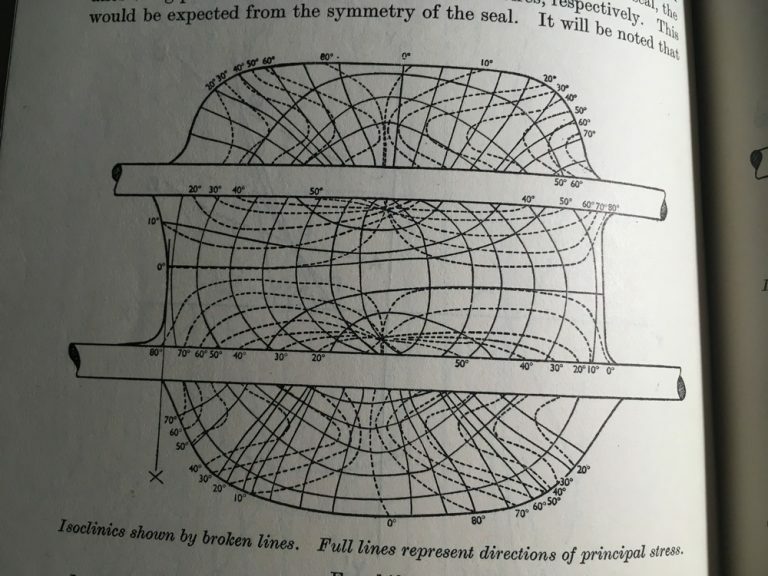 I am building an oven for baking out the tubes. 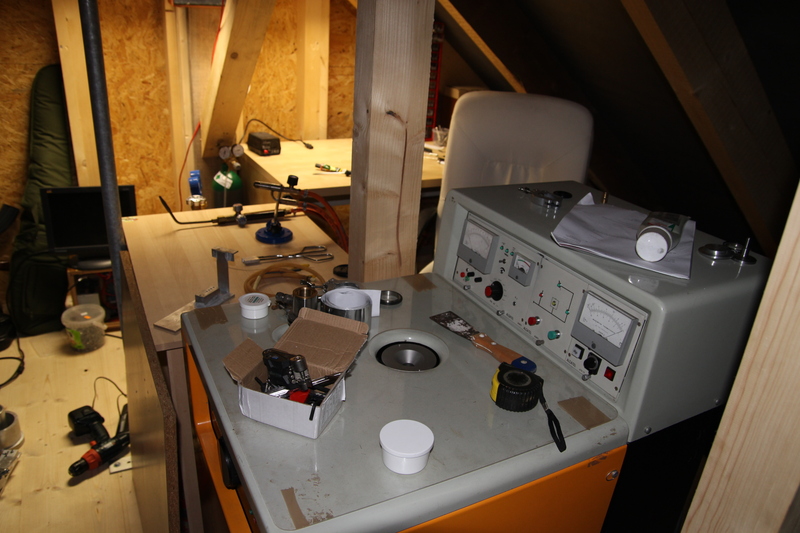 Nixie workshop II., this time in the attic! 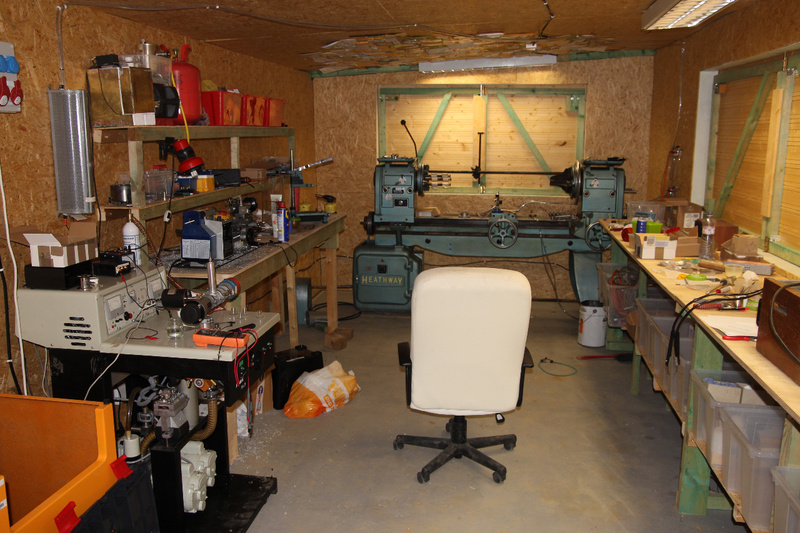 Two tables, thats twice as much room as in the workshop in my cellar shop! 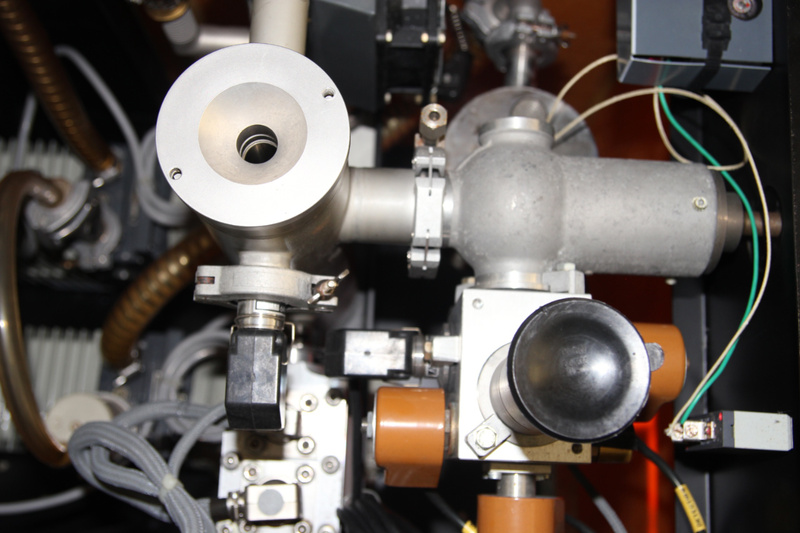 It took months, but the helium leak detector is fully repaired and running! I also made another design for the glass lathe, v2.0.. I am spending lot of time with family (three babies now), but there is still time to make progress.. I set up a new glassworking torch with oxygen/gas manifold, some other torches, small glass saw, new spot welder (working perfectly), a chuck for the glass lathe and some other minor things. I got a bunch of old vacuum tubes and started to study their inner structure, seals and other details. One night, after a celebration of newborn twins with friends, I sat at the computer and found eBay listing offering Alcatel ASM 51 helium leak detector, I was in very good mood so it didn’t last long and it was on the way to me! This machine was one of the most important addition to my shop! I made first experiments with gas discharge (in air). It was pretty exciting, so I bought argon to see what the noble gas will do! The HV power supply was a must, so I build one! I also started making my own glass lathe, it never worked much well. 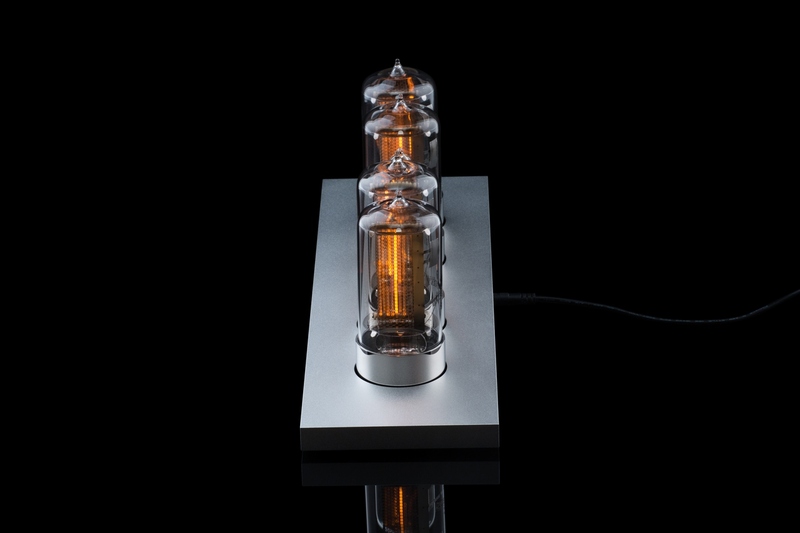 I need tubes bigger than tiny IN-14, however buying six pieces of Z566M or similar means spending of around $250. Quite a lot. (!) 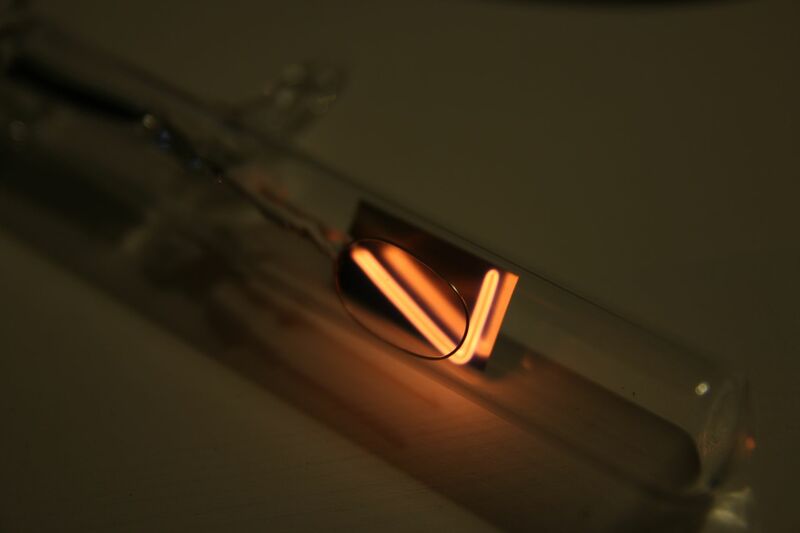 Looking on the simple glass tube and metal structure inside, I got the idea of making nixie tubes myself. I thought I would just find a book with detailed description of how nixie tubes had been made. However, it turned out I was too naive – information about nixie tube manufacture were pretty scarce! But I didn’t give up, after some time, I collected basic information and got idea of sharing them publicly. 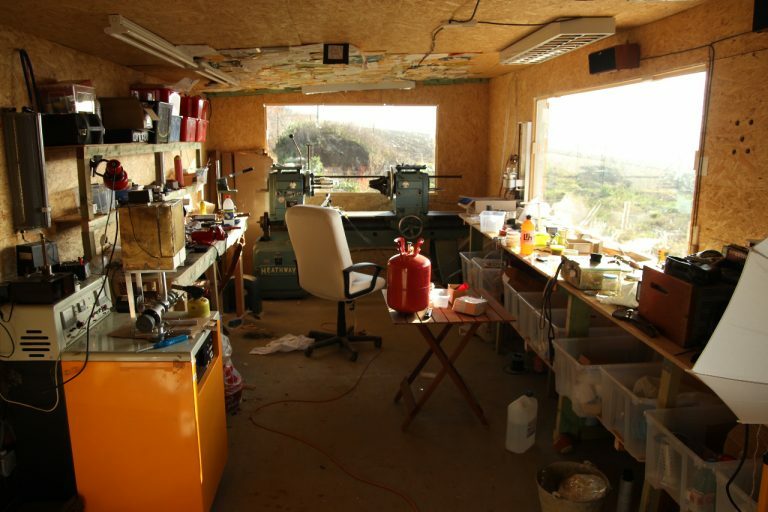 It was a difficult decision as it is natural to protect your know-how, but I eventually started to write a blog about my efforts to make nixie tubes at home. 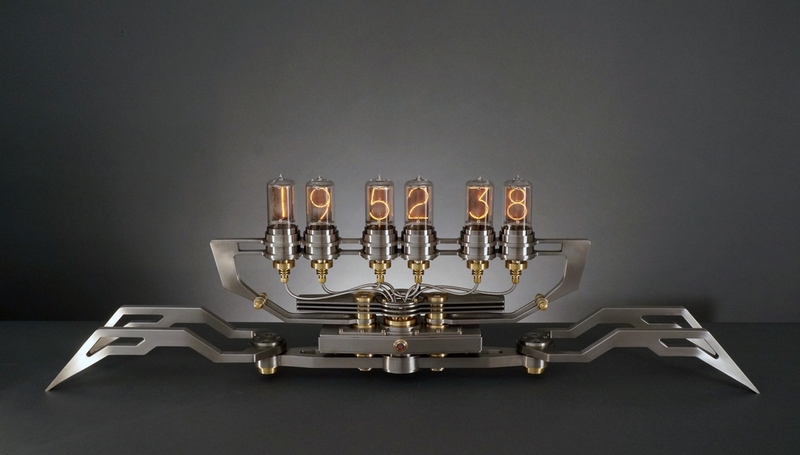 I discovered nixie tubes accidentally when browsing internet.